Been a while since I've been around...I guess I've been satisfied with the current state of the collection for a while. That doesn't mean my WIFE is satisfied though. She has had her eye on the Cartier Baignoire pink Gold for a long time. So long, that I can't remember what size she had been interested in and tried on. When I look at the Cartier site, there is only a "mini" and a "small" model available. I am certain she does not want the mini, but I don't recall the model she wanted being a "small" either. 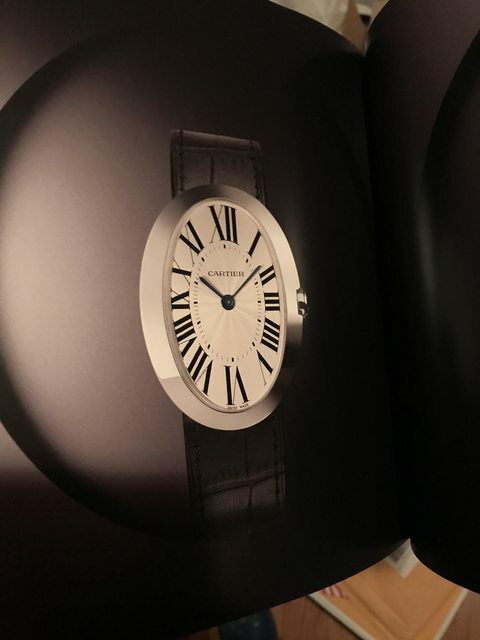 I chatted on the site with Cartier and they said the "large" models have always had diamonds on them. I'm not so sure sure that is correct and we aren't interested in diamonds. Long story coming to an end....does anyone know if there used to be a "large" model of the ladies Baignoire in pink gold? I see it online with model W8000002 but at a much higher price than I had remembered. I recall the MSRP to be around 11K. Any insight would be appreciated....thanks! Yes, I recall there was a large pink gold Bangnoire, manual wind, without diamonds. My wife looked at one many years ago at the 5th Avenue Flagship boutique. I have not been able to locate any information regarding the pricing of the large PG ladies Baignoire. Below is a photo, from a Cartier catalog I have from the Holiday season of 2009. It shows a large white gold version of the Baignoire without diamonds, however no price was listed. One difference between large manual wind model and the small quartz model, is the placement of the "Cartier secret signature." On the large manual wind Baignoire, it is part of the "V" of the Roman numeral VII, while on the small version the "Secret signature" is part of the Roman numeral X. So this is proof the large model without diamonds did exist, even if current sales people do not recall this piece.